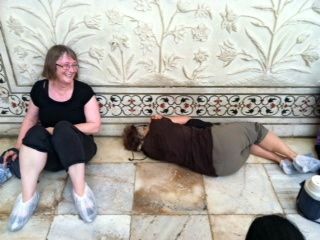 My friend Jane Whitmer was kind enough to let me use this photo of her at the Taj Mahal. Talk about trooper: Jane had bedbugs, Delhi Belly, and it was 120 degrees fahrenheit on the day she visited this Wonder of the World. Here’s the Travel Oops Interview about Jane and her travels to India. For a Westerner, India seems ready made for a Travel Oops. Certainly, at the very least, visitors, inevitably, encounter the unexpected. 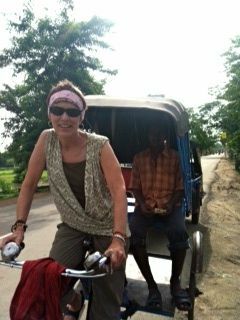 A seasoned traveler, Whitmer had wanted to visit India for the past 10 years. After arriving there in June, her adventures included having a cobra rest on her head; meditating and doing yoga at an ashram; staying at a rickshaw driver and his family’s house; walking on a back road that included obstacles like irrigation channels, barbed wire fences and bulldozers; and riding on a bus that traveled via a one-lane road over an 18,000 ft. mountain pass — just to name a few.